We didn't think of this funeral weekend as vacation, but we did stumble upon one cheap adventure to report (in case anyone will be traveling down I-16 toward Savannah this summer.) The kids needed to blow off some steam after the formality of the day. 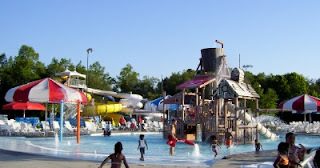 I found a municipal waterpark called Splash In The Boro (Statesboro, GA). Admission costs only $5 on Saturdays after 5 pm; the park is open until 8 pm. The crowds had thinned by then and we had our choice of comfy lounge chairs. Splash In The Boro blew us away. The employees and lifeguards were clean-scrubbed and friendly. The 2 children's pools both had beach-entries and bubbling fountains for little ones--in addition to this giant tower of fountains and slides for older children. We had to pry Andrew away by his fingernails. Splash In The Boro has life jackets available for children at no additional charge. We used them for floating down the Lazy River in intertubes. You can either buy food at the not-overpriced Snack Shack ($2 for a hamburger) or take a picnic to enjoy around the city park's lake outside. I didn't know a small, local waterpark could be this cool, at least for young children. We had kicked around the idea of Dollywood's Splash Country later this summer, but I think we'll just enjoy Splash In The Boro when we visit family instead. Later I noticed that Georgia Southern University a few minutes away also offers three free educational centers, making for a budget-friendly trip indeed. Do you have a great, cheap water park nearby? Leave us the details in the comments. This looks really cool. We could spend hours there. We have a water park run by our city's parks and recreation department. It has loads of cool slides, a lazy river, a little kid area. It looks pretty neat. I just checked the cost online. It's quite the bargain, compared to a trip to Hurricane Harbor. Our local water park is only $5 for admission. However, if you're a resident, it's only $4. It's $3 at twilight, and kids under 3 get in free. Sounds like a bargain! We have one about 30 miles away. No pools, just the fun "faucets". The park is open from Memorial Day to Labor Day, and $25 buys a family season pass, good for 10 visits. My kids love it...and so do I! 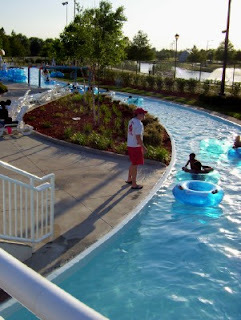 We have 2 of these type of water parks in our area. We are lucky. It is some place wonderful for a grand mother (me) to take 4 visiting grandchildren. We go several times a summer. The cost can't be beat. Even though we are close to home, we still take a lunch and picnic when we are there. It adds to the fun. Wet N Wild is near us in Greensboro, NC (piedmont region) but it isn't that cheap. You can buy a season pass before Jan 31 for $50 a person which is a good deal if you plan on going several times that year. Sounds like a fun place to go. If I'm ever down in GA we'll check it out. Hey, if you don't mind, let's make a list of all these low-cost water parks for everyone reading! If you don't want to reveal where you live as a blogger, just sign in as Anonymous and leave us the name/city of your favorite budget water park or neat swimming area! I'm in Lewisville, TX. We have 2 of those cheap water parks I mentioned above. I looked at the website again, and there are inexpensive season passes available, too. What a great deal, Meredith!! Wow, Meredith...what a small world!! I found your blog a few months ago through the one woman's cottage life and have enjoyed reading all your posts. When I saw that you were headed down to GA, I wondered what part. When I saw your post about the mennonite market, I wondered if you were headed to Statesboro...then today saw your post about the waterpark...I live in Statesboro!! I have been enjoying reading your blog (we have lots in common. I have two small children..well, I will have three in 9 days...woo hoo...i love decorating on the cheap, etc. I love how you used that verse from Proverbs for your blog). Anyway, I just wanted to say hello and I hope that I have the chance to meet you sometime. My oldest son is 4 1/2 (isn't that close to your son's age?). Maybe we can meet up at the waterpark sometime if you are down again later this summer!! Or, the Raptor's Center at the college is great and free. I bet your children would love that, mine do!! 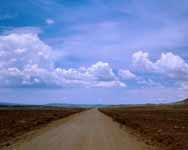 For safety reasons, my husband doesn't want me to announce where we're headed until we've already passed through. Anytime I've "live blogged" a trip it's actually been a couple of days later. We won't be near Statesboro again for at least several more months, but I'll let you know next time! Enjoy that new baby! We have driven by this water park several times, but didn't know it was great. Thanks for the info. We will definitely try it sometime. Statesboro is only about 1 or so away so that's fantastic day trip. We've been looking for something fun like this to do with our girls! Though, my hubby may think a two hour drive is too far away! This is the closest thing I've heard of so far! What a great find! Thanks for visiting my blog and sharing your thoughts with me on that book. I am most likely going to order it from Amazon since it's in my cart with some other books (I may ask about next!). How neat you are in GA too. Well at least I think you are from that post. We are in the metro ATL area. I'll be back to visit your blog for sure! PS- I love finding bargains too. Hae you tried Craigs List? I have had the best transactions buying and selling there. It's not as elaborate as this, but the aquatic center at the Wackford Community Center in Elk Grove, CA is a nice find for the Sacramento area. Here are its features: 25 meter by 25 yard competition lap pool, a zero-depth entry recreation pool with a 146 foot water slide and waterplay features, and a spray pool for children 6 and under. $5 per person ages 5 & up, $3 ages 2-4. There are several shade structures, the snack bar isn't outrageously priced, AND you are allowed to bring your own food as long it's not in glass. There is also something similar in Folsom, CA but they don't allow food so not so suitable for a day trip. As you can tell by the date of this comment, I have been checking back on this one to see if anyone lists anything in my area. How does one go about finding out about this? I don't even know where to begin googling for info! LOL!! :) I would LOVE to be able to do this (and like your tip about going for the cheaper price WHEN THE CROWDS HAVE DIED DOWN (never thought about that). :) Maybe the topic for a blog entry?? Meredith--I am so glad that you found "our" waterpark. I say "our" because I am the Marketing Coordinator for Splash in the Boro. I was searching the web tonight and came across your blog about finding us. We are the only waterpark of our kind in the area. It's true, we are inexpensive mainly due to the fact that our waterpark was built by a Special Purpose Local Option Sales Tax. We greet over 100,000 guests from mid-May until Labor Day. I can give you a little "insider info"--the best days to come (when crowds are low) are Mondays, Tuesdays and Wednesdays. You can always see our prices, attractions, etc at www.splashintheboro.com. But just because it's getting cooler, it doesn't mean we're closed! We have a bubble dome that will be constructed over the 2 olympic sized pools in October so that we can host Learn to Swim lessons, water aerobics, lap swimming, and more. This dome allows us to keep the temperature around 80 degrees at all times (the pools are around 85 degrees). No cold water here! If you are back in town from now until April, bring the kids to Family Recreational Swimming on Saturdays from Noon until 4 p.m. It's only $3 a person! I don't want to sound like an advertisement, I am just so glad that you found us and thought enough of us to post a blog (with photos!). The waterpark in statesboro is so nice my family went last year and we plan on going in the near future, great for little ones! the snack shack in so reasonable you dont feel as though you are getting ripped off by the high drink cost or food cost. we cant wait to go back it is on our to do list for the summer. with gas prices like they are we are looking for low cost things to do on our vacation to savannah any ideas?